Guest post and Giveaway! 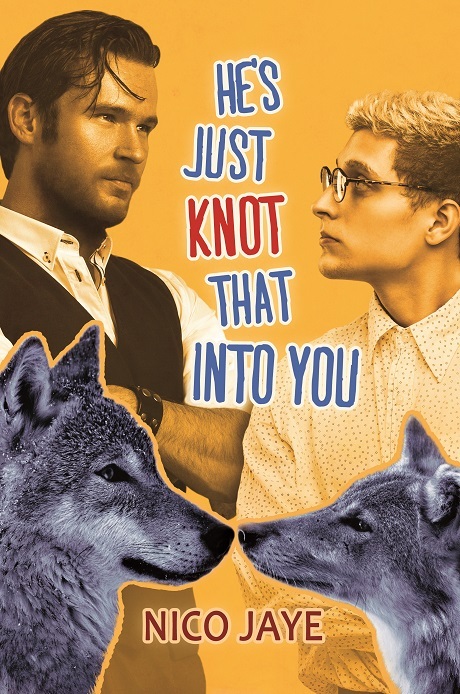 He’s Just Knot That Into You by Nico Jaye | Because two men are better than one! When Tanner moves to Chicago for a new job, he experiences his First Shift, a revelation that signifies he’s met his mate since the last full moon. The only problem? He doesn’t know who it is. To find his mate, he enlists his new assistant Jon to arrange a series of dates, but each one turns out more disastrous than the last. With the next full moon quickly approaching, Tanner finally determines the identity of his true mate. Unfortunately, Jon has since disappeared, and Tanner must now begin a new search. Is it really Jon’s family crisis pulling him away, or is Jon just not that into him? There will be a giveaway across blog visits. 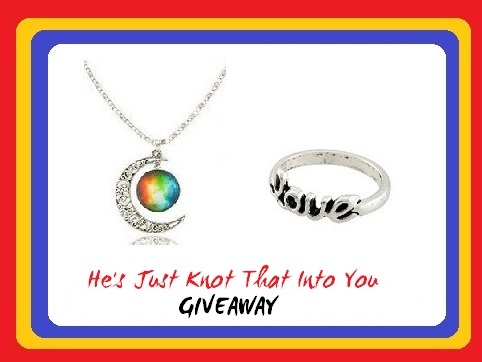 Two winners will be chosen, and each winner will receive (1) their choice of an ebook from my backlist (not including HJKTIY), (2) a pretty ring with the word “love” inscribed on it, and (3) a crescent moon necklace. There are no shipping restrictions, and this giveaway is open worldwide where permitted by law. The raffle will end on April 1st. Click on the helicopter to enter. A note from Nico: Some of you might be wondering what First Shift means to an alpha werewolf in this universe. Well…here’s a little taste of the opening scene. Hope you like it! He’d suspected nine days ago, but he hadn’t dared to hope. This night, though, with the first full moon since he’d started at Dilarium, confirmed it. Curled up on his side in the living room of his subleased townhome, Tanner gritted his teeth, his eyes squeezing shut as he felt the irrepressible movement of bones shifting beneath his skin. The silky carpet was cool and soft against his cheek, and he pressed his face into it, struggling with that over which he had absolutely no control. His body was on fire, his blood pumping through his veins at supersonic speed. An invisible spike pierced his fingertips, one by one, while his jaw rearranged itself on his face. He couldn’t hold back the scream that ripped through him as he felt his spine stretch, then curve, turning him into that one elusive form he’d craved for all of these years: werewolf. A First Shift was supposed to be the hardest. The first time bone broke and mended in its transformation into that creature of the night. The first time claws extended, pointed tips puncturing nail beds to replace human fingers. The first time fangs punched out, the teeth of a hunter replacing those of a benign human. A First Shift was shocking. It was thrilling. It was painful. Above all, it was exhilarating. A First Shift meant he had found his mate. Hi! Thank you so much to Because Two Men Are Better Than One for inviting me to chat a little about my new book, He’s Just Knot That Into You. I had a lot of fun writing this fluffy werewolf novella and am excited for you to meet Tanner and Jon. =) Right now I’m touring the web to talk about the book, how it came about, my processes—and anything else that comes to mind, to be honest. Of course, a blog tour wouldn’t be complete without a giveaway, so please check out those details at the end of the post! Today I’ll be talking a little bit about bow ties. Jon has a particular affinity for bow ties, and Tanner can’t help but notice the various different patterns Jon shows up to work wearing. Some of you might be wondering why Jon wears bow ties. In a world of business casual, surely he’d be more comfortable in an open-necked button down or a polo shirt, right? Well, it all started when he began to work at Dilarium Press. You see, Jon’s been blessed (or cursed?) with a baby face, and when he first started at Dilarium, almost everyone he encountered thought he was an intern and treated him as such. Once he began dressing more business than casual, though, he finally got the professional treatment he deserved. Of course, it also helped that he was great at his job, but we all know first impressions make a big difference, too. In HJKTIY, Tanner’s first impressions of a lot of people end up being vital information for him because he meets his mate that first day he starts working at Dilarium. Unfortunately, his first impression of Jon is of a too-young-for-Tanner guy whose baby face suggests he’s much younger than he really is. How does Jon overcome that first impression? How does Tanner learn to look past that initial judgment? You can find out in He’s Just Knot That Into You! =) If you decide to check out the book, I hope Jon and Tanner leave you with some sweet and memorable first (and second!) impressions. Nico Jaye is a fan of all things HEA and has dragged her romance collection along for her moves from San Francisco to Los Angeles to Chicago to New York and back. She thinks reading is awesome and loves that she can hang out night after night with crinoline-wearing debutantes, brawny firemen in suspenders, and werewolf shifters with Scottish brogues. An overall feline enthusiast, Nico secretly (or not so secretly?) adores Hello Kitty, cat GIFs, spontaneous traveling, pretending to be crafty, emoticons, hot menfolk, and parenthetical statements (not necessarily in that order). After starting as the pitcher for Team Awesome (literally) and visiting places like South Africa, Oman, and Fiji, Nico discovered that letting the boys in her head tell her where they want to go could actually be the most exciting journey of all. My favorite animal is dolphin! !